Many tourists spend a few days in several different Italian towns, or come to Florence for just one day. Most people know that Florence is famous for leather and gold, but figuring out where to shop for these items can be daunting! The number of stores, the quality, varying hours of operation and the language barrier complicate matters further. After years of shopping here, I have discovered the real Florentine shops. Let me show you my favorite shops – not the big designer stores, but the owner-operated shops that have equal quality at better prices. I can even take you to a master goldsmith’s workshop. They can design unique wedding rings or jewelry, have ready made pieces, and are way off “the beaten path” even though they are right in the center of town! You want to make the most of your time in Florence – there is so much to do and see! I can save you time and energy by taking you on a targeted, well organized shopping trip designed just for you. 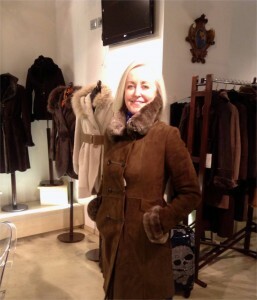 Whether it be leather jackets, handbags, shoes, gold jewelry, Florentine silk scarves, ceramics or wine, I can show you one of a kind shops with owners on site, and locations only here in Florence. If you have special needs, I can help. Partners who don’t enjoy shopping can be directed to an historical site, or to a spot for coffee or wine. Difficult to fit? I can take you to places that will custom make shoes, boots and leather jackets at prices that will please you. No pressure to buy anywhere, and I insist that anything you purchase you must love! If my time allows, I am happy to do “remote” shopping for you. I have done this often for former shopping clients, who are thrilled to be able to purchase beautiful Italian goods from home. If I am not able to take you shopping, or if you prefer to shop alone, I can design a shopping itinerary with detailed directions for you. Back at home and can’t stop thinking about that certain item you wish you had bought? I can purchase and ship items for you. 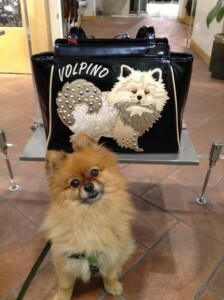 Be sure to view my blog to see the latest shopping adventures! I am accepting appointments now. I will do my best to accommodate you even at the last minute!